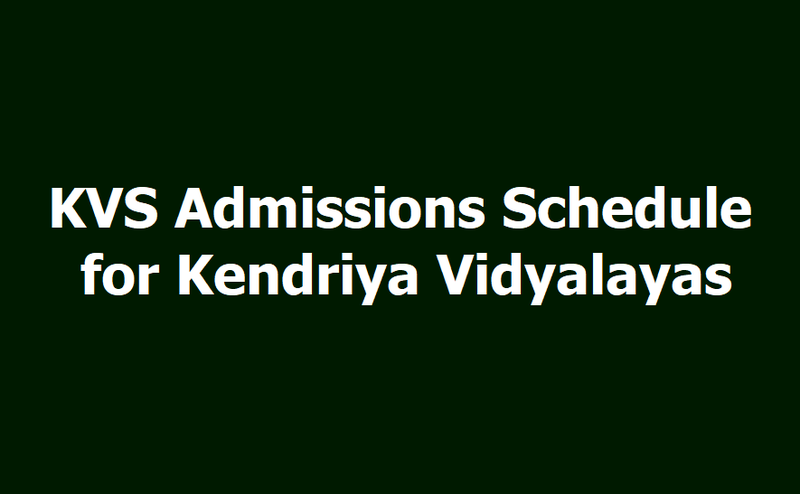 KVS Class I/II/XI Online admissions Schedule for Kendriya Vidyalayas, KVS Kendriya Vidyalayas admissions, KVS Online admissions @ http//darpan.kvs.gov.in. KVS Selection List/Results, Last date for online applying/Registration for Class I,II,XI, KVS admissions Selected list Declaration Date @Kendriya Vidyalaya Shaala Darpan. KVS admission 2019-2020: The online registration process for admission in Class 1 of schools under Kendriya Vidyalaya Sangathan will begin from March 1 at 8 am. The candidates who want to apply can do so through the official website, kvsonlineadmission.in till March 19, 2019. Kendriya Vidyalaya Sangathan will close down the KVS Admission 2019-20 on March 19, 2019. Parents who will have to apply for the admission process can visit the official site of KVS at kvsangathan.nic.in. The online registration process commenced from March 1, 2019. Kendriya Vidyalaya Sangathan has nearly 1200 KVs across the country. After the children of central government employees, around 25% of seats are reserved for children belonging to economically weaker section and socially backward families under the Right to Education (RTE) Act, 2009. The provisionally selected first list for Class I will be declared on March 26, the second list will be out on April 9 and the third admission list will be out on April 23, 2019. Parents who want to check for more details of KVS Admission 2019-20 can visit the official site of KVS and check info. The registration process for Class 2 will be conducted from April 2 to 9, 2019. However, the application process for Class 11 will be released immediately after Class 10 result. KVS will release the list of provisionally selected candidates for Class I on March 26 and the second and third list will release on April 9 and April 23, respectively. The merit list will be published only if seats remain vacant after the release of the first merit list. In case sufficient applications are not released, the KVS will extend the registration date, notification of which will release on March 30 and will close on April 6. Similarly, the education institute may release the second notification. The schedule is available at kvsangathan.nic.in. Last year, a total of 6,48,941 aspirants applied for around 1 lakh seats. Since the admission process is online, KVS had released the list on time. The list can be seen on the official website of the individual schools. There is a total of 1,137 Kendriya Vidalayas across the country. The students will be shortlisted as per the priority category. Primary Education: Kendriya Vidyalaya Sangathan had set up a task force in 1994 to suggest a specific course of action for the strengthening of Primary Education in the Kendriya Vidyalaya. This Committee made some recommendations with an emphasis on joyful learning through an activity base approach. Accordingly the K V S has adopted the activity based approach for teaching at the Primary level, together with a system of grades for assessing the child’s performance. The aim of assessment is to improve the child’s capability rather enforcing retention in the same class. ~ The Vidyalaya will spare one class room of suitable size on the ground floor. ~ A development fee of Rs. 400/- per child per month will be charged. ~ Class-strength should be between 20 to 25 only. ~ Age of the child should be four years as on Ist April. The upper age limit is 5 years. ~ Duration of the class will be 4 hours and will be conducted 5 days a week. ~ A Nursery trained teacher and an Aaya will be engaged on part-time basis. At present pre-primary education is implemented in 166 Kendriya Vidyalayas. he Kendriya Vidyalaya Sangathan (KVS) started the offline registration process for admission to Class 1 (left over vacancies) and class 2 to 9 from April 2. The last date to apply for the same is April 9. "KV Class 2 to 11 admission process will be done through offline mode in KVs across the country subject to availability of vacancies,". Meanwhile, the online registration for KV admission to Class 1 was held from March 1 to March 19, 2019. Note: The registration form will be collected from the Vidyalaya during working hours. THE OFFICIAL NOTIFICATION READ: "For Class 11, application forms will be issued immediately after the declaration of Class 10 results, subject to availability of vacancies in the Vidyalayas," said a notification. NO AGE RESTRICTION FOR CANDIDATES SEEKING ADMISSION TO CLASS 11: "There is no age restriction for admission to Class XI provided the student is seeking admission in the year of passing Class X examination. Similarly, there will be no upper and lower age limit for admission to class XII provided there has been no break in the continuous study of the student after passing class XI' read an official statement on the KVS website. 'Reckoning of age for all Classes shall be as on 31.03.2019. Reservation of seats will be as per KVS Admission Guidelines available on the website (www.kvsangathan.nic.in)," read the notification. Note: To know more about the KV admission, parents may contact the Principal of nearby Kendriya Vidyalaya. The admission test for class 9 will be conducted on April 11 at 8:30 am in the Vidyalaya premises. For any query, candidates can check the official website.